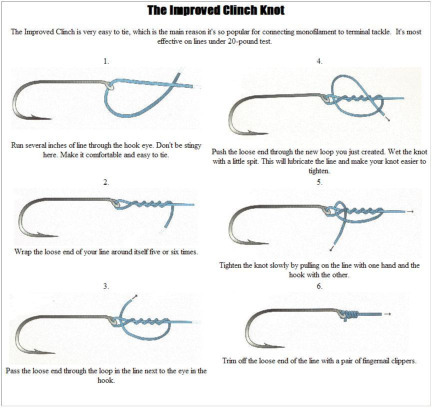 The Improved Clinch knot, like the clinch knot is used mainly to attach your line to a hook, lure, or swivel. This improved version adds an extra tuck under the final turn. This knot is not recommended if you are using over 12 pound test line. This knot is also an old standby for many fishermen. By using the extra tuck at the end of the process, this knot become even stronger then the clinch knot and it is worth the extra effort. 1. Pass the line through the eye of hook, swivel or lure. Double back and make 5 turns around the standing line. 2. Hold the coils in place; thread end of line through the first loop above the eye, then through the big loop. 3. Hold the tag end and standing line while coils are pulled up. Take care that coils are in spiral and not lapping over each other. 4. Slide tight against the eye.